Fractures are discussed theoretically and practically. This book represents a conscious effort on the part of the author to detail the "life" of a crack, from its inception, through its growth, to its culmination. The author is careful to define all key terms within the text, making this book an excellent reference for anyone working with brittle materials. 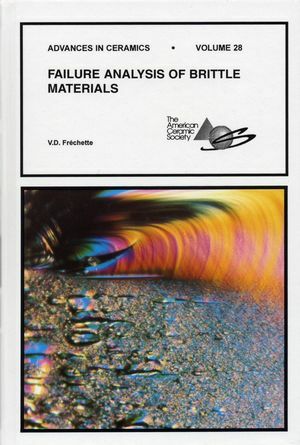 V. D. Frechette is the author of Failure Analysis of Brittle Materials: Advances in Ceramics, Volume 28, published by Wiley. Initiation and Development of Brittle Failure. Fundamental Markings on Crack Surfaces. Estimation of Stress at Failure. Examples in Practice (Case Studies of Ffracture in Consumer Products).